Liquified Petroleum Gas composite cylinders have a a huge variety of applications. The main one being domestic use, including heating and cooking, but apart from the indoor use they can be adaptable also to outdoor use, such as caravans, boating, camping, BBQs and hot air balloons. However, we cannot ignore composite LPG cylinders can also be used for forklifts, as their features, prevent any risk of accident, by keeping safe the job of many employees. Forklift safety is subject to a variety of standards worldwide. The main standard is called ANSI B56, whose stewardship has been passed from American National Standards Institute (ANSI) to the Industrial Truck Standards Development Foundation, after several years negotiations. The latter one is a non-profit organisation with the only purpose of promulgation and modernising the B56 standards. Other forklift safety standards have been implemented by the Occupational Safety and Health Administration (OSHA) in United States and by the Health and Safety Executive in United Kingdom. As UKLPG has mentioned, it is essential to point out the importance of selecting the correct gas detection technology on explosion proof forklifts. Forklift trucks are widely used to transport bottled gas or materials in cylinder filling operations or at distribution centres. There are many types of gas detection systems but if used on forklift trucks as part of a complete explosion proof solution, we need to consider typically two options, starting from understanding the basics of an explosion proof forklift truck design for use in a Zone 2 hazardous area. Areas where flammable gas is stored in bulk are typically classified as Zone 2 hazardous areas requiring ATEX compliant explosion proof forklift trucks. In many countries forklift truck operators must be trained and certified to operate forklift trucks. In UK, the Provision and Use of Work Equipment Regulations state that operators of forklift trucks must be adequately trained, according to the general standards of that training and good operating practice which are found in the HSE Code of Practice 117 (Third edition) issued in 2013. 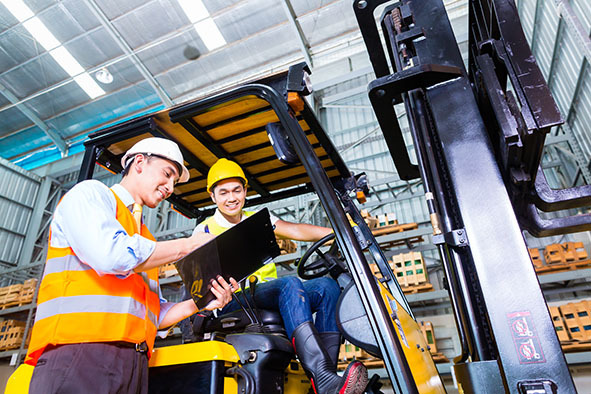 Furthermore, third party organisations have developed “best practice” standards for forklift training, commonly referred to in the UK as a “forklift licence”. However, organised training helps to demonstrate that an employer has taken steps to guarantee its “duty of care” in case of an unfortunate event or an accident. In the light of what has been reported, it appears clear that the main issue concerns the necessity to guarantee forklift safety standards worldwide. As reported by Forklift Training, the really good news is that accidents involving forklift trucks in the United Kingdom have decreased over time. In the year to April 2013 there were only six fatal accidents which although too many, is much lower than the 30 annual deaths that were reported annually when I started in the forklift industry in 1970. However, it is essential to point out the necessity to eliminate any risk of danger or physical damage for employers and composite LPG cylinders may provide high safety standards to sort it out.